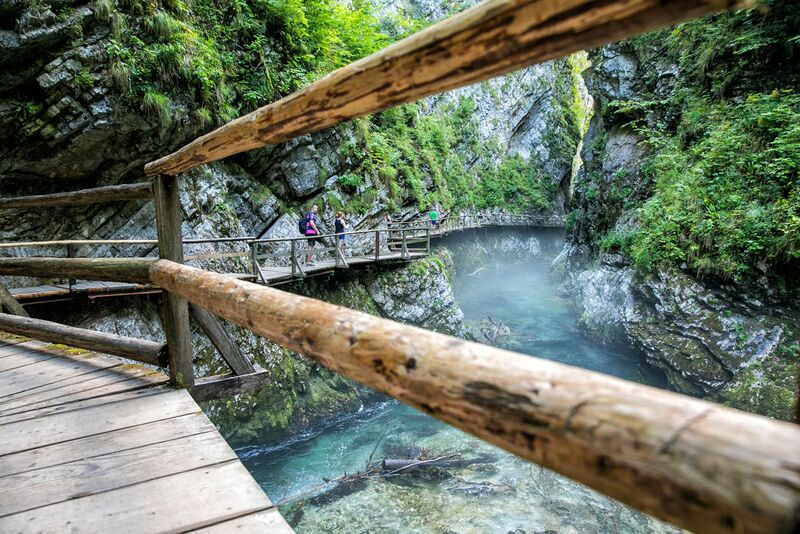 Without a doubt, Vintgar Gorge is one of the most magical places to visit in Slovenia. For 1.6 km, boardwalks crisscross their way along the Radovna River, creating an enchanting landscape that is photogenic and fun to explore. 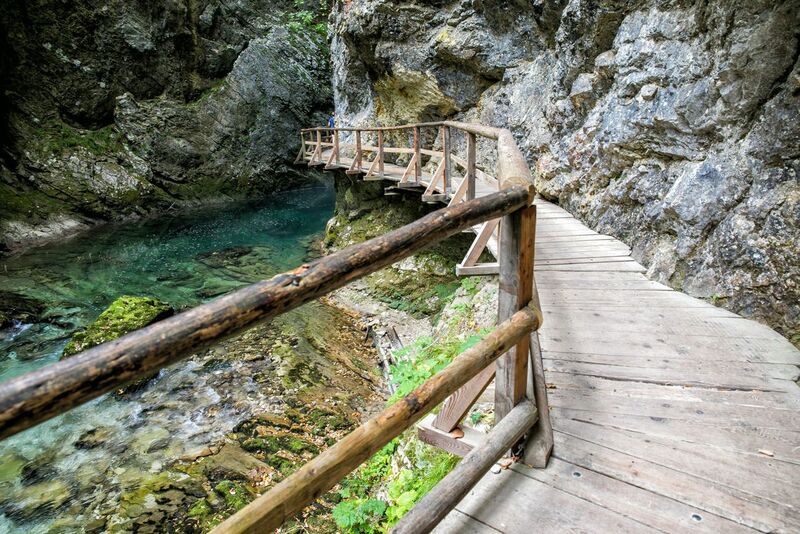 Vintgar Gorge is one of Slovenia’s most popular attractions. 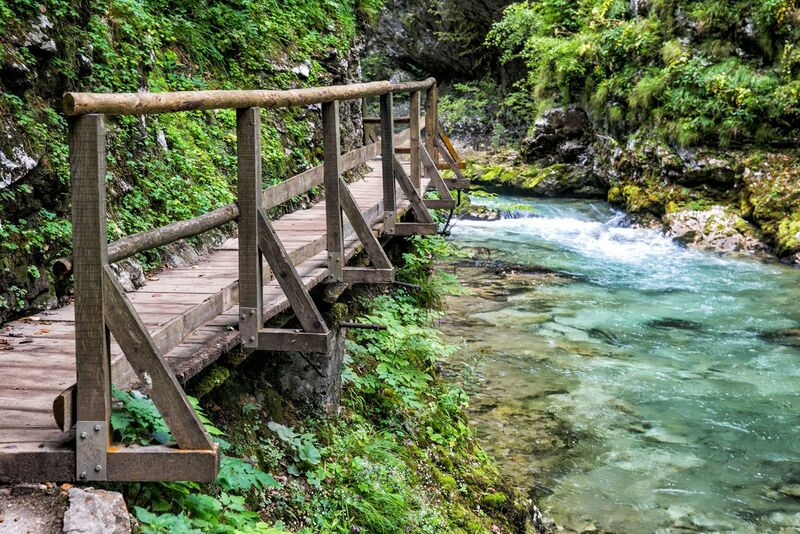 Vintgar Gorge was one of our top experiences in Slovenia. 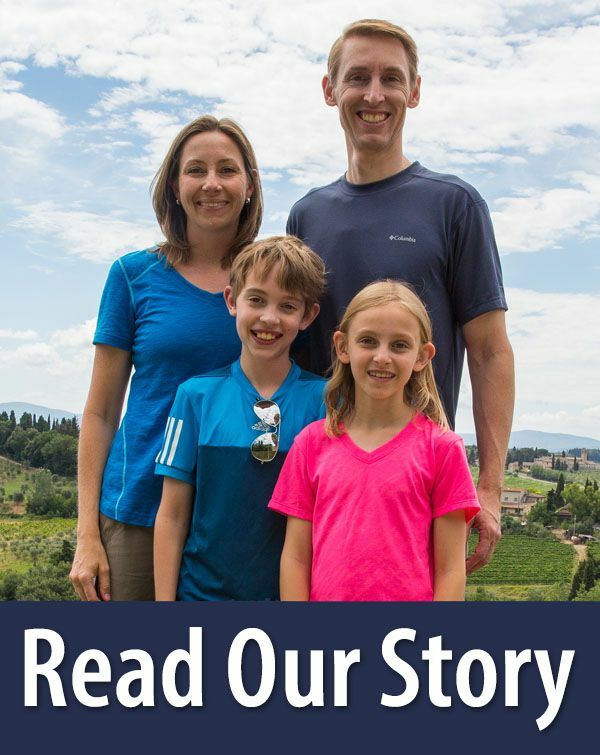 It’s gorgeous, it’s easy to walk, it’s easy to get to, it doesn’t cost a lot of money, and it’s fun for the entire family. 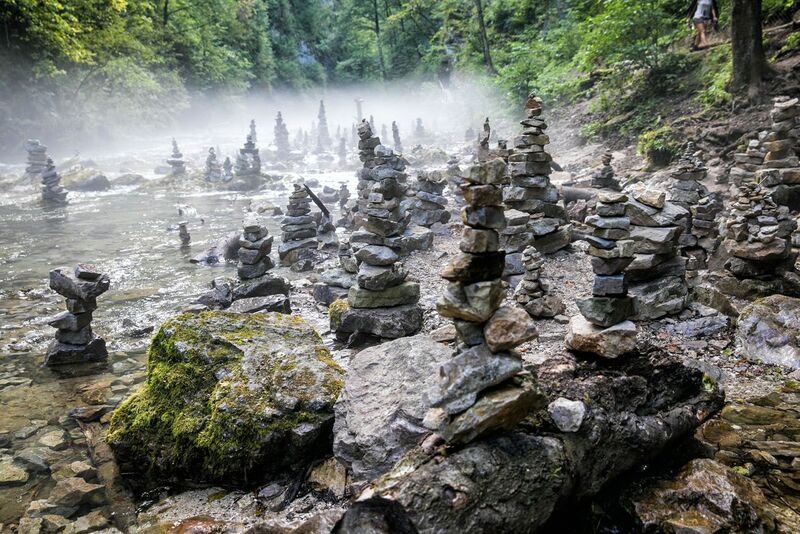 If you are looking for a very cool experience to add to your trip through Slovenia, put the Vintgar Gorge on your list. 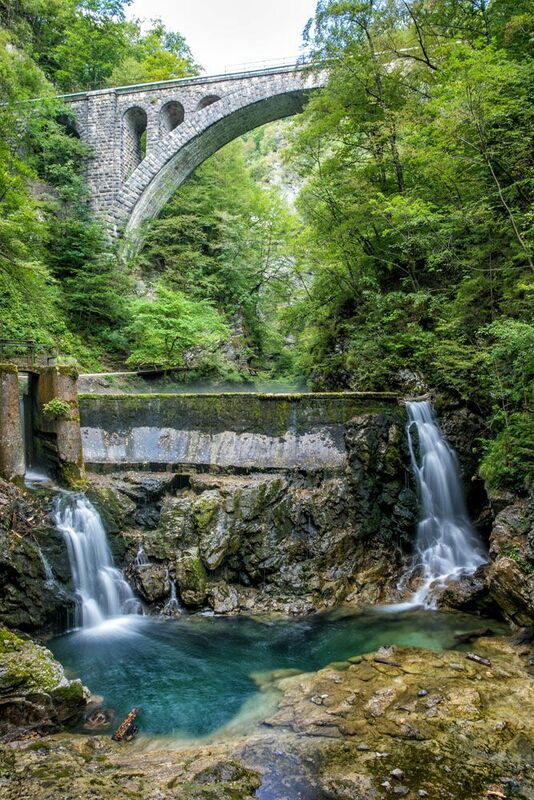 Vintgar Gorge is a 1.6 km long gorge located in Triglav National Park. 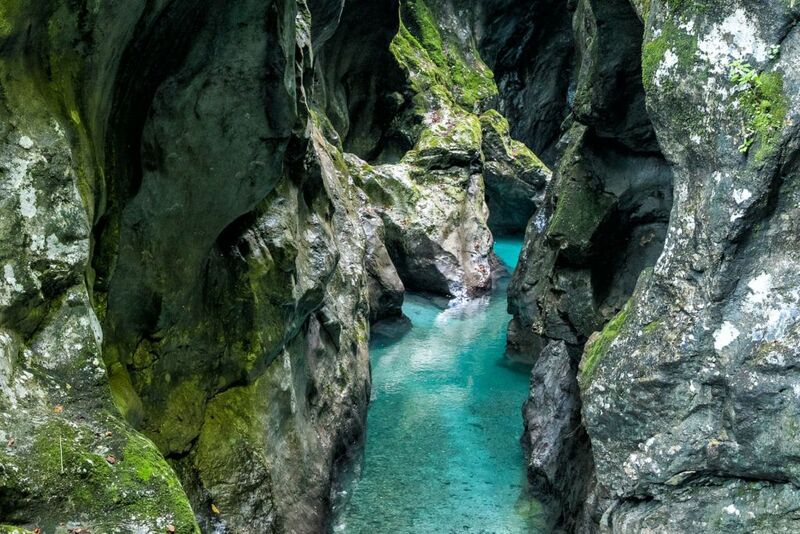 The gorge has been carved out by the Radovna River, a crystal-clear river that looks emerald green or aqua depending upon the lighting conditions. 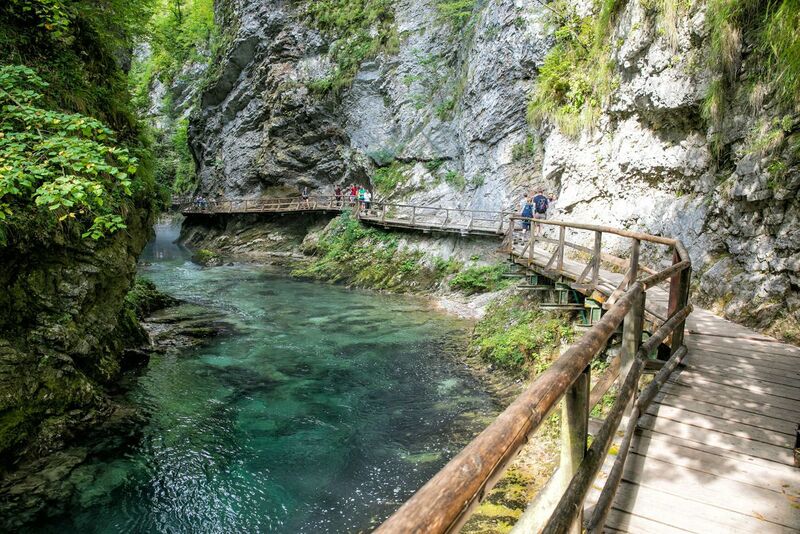 The boardwalks that are erected along the Radovna River are what make this gorge visit so special. For short periods of time you are suspended over the river, which can be a thrill to walk and really fun to photograph. 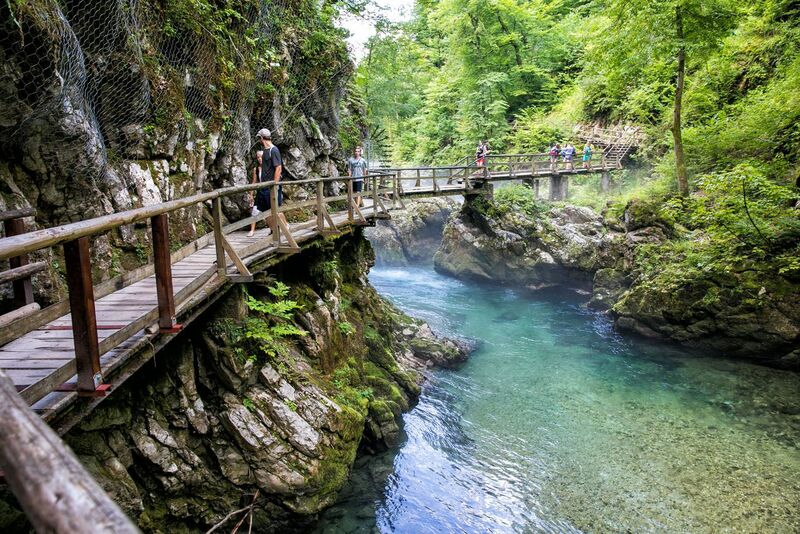 Now, thousands of tourists visit Vintgar Gorge every year. The summer months of July and August are peak season, so if you will be visiting during this time, expect to share the boardwalks with a lot of people! 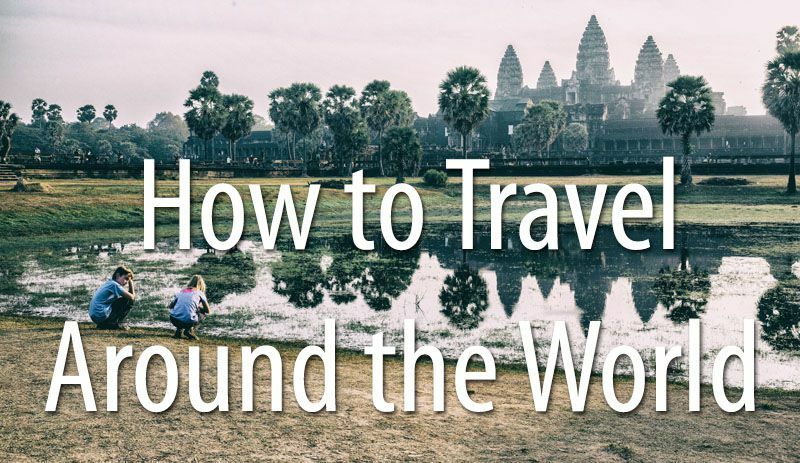 The easiest way to get here is by car. There are several large parking lots near the entrance to the gorge. Next to the entrance of the gorge is a very large lot and this is the best place to park. There is a second lot located uphill from the gorge and from here it is about a 10 minute walk to get to the entrance (downhill to the gorge, uphill to get back to your car after your visit). These parking lots fill up fast! We arrived at opening time and there were just a few cars in the main parking lot (the lower lot next to the entrance). By the time we left the gorge almost 2 hours later (at about 9:45 am), both lots were filled and a traffic jam was forming as more cars were struggling to find an available parking spot. 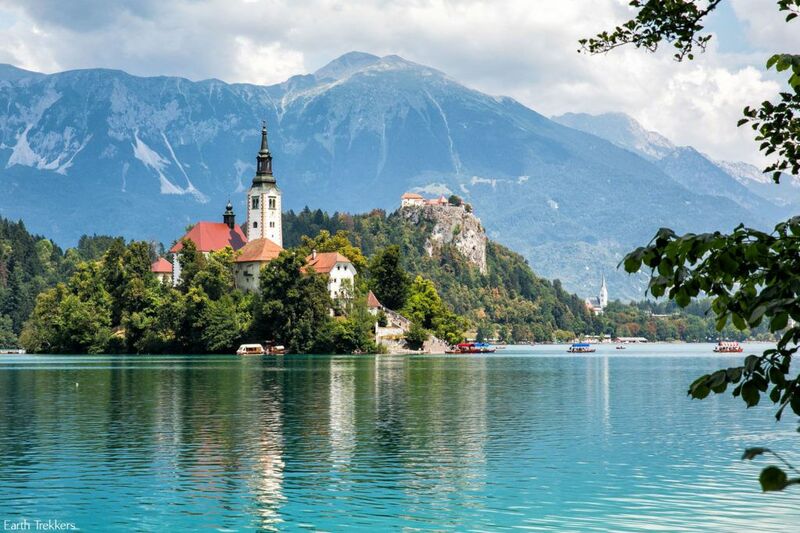 There is a shuttle bus that runs from Bled to Vintgar Gorge several times a day (1€) from June 30 to September 16. Currently, the first bus of the day drops visitors off at the gorge at 8:55 am. 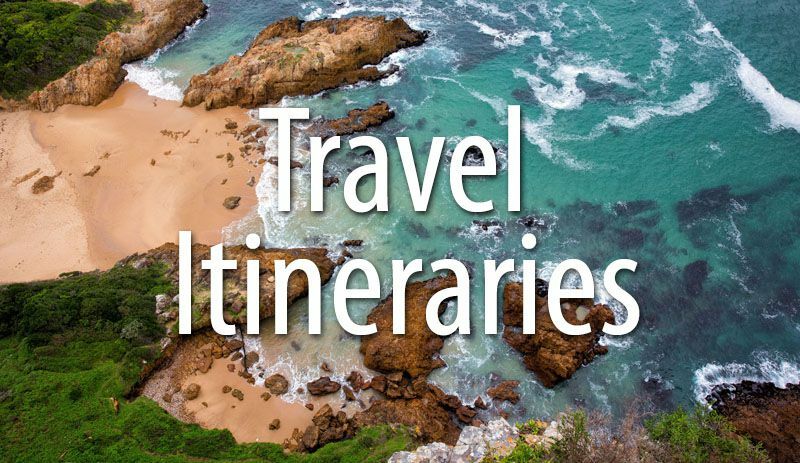 For the shuttle bus schedule click here. 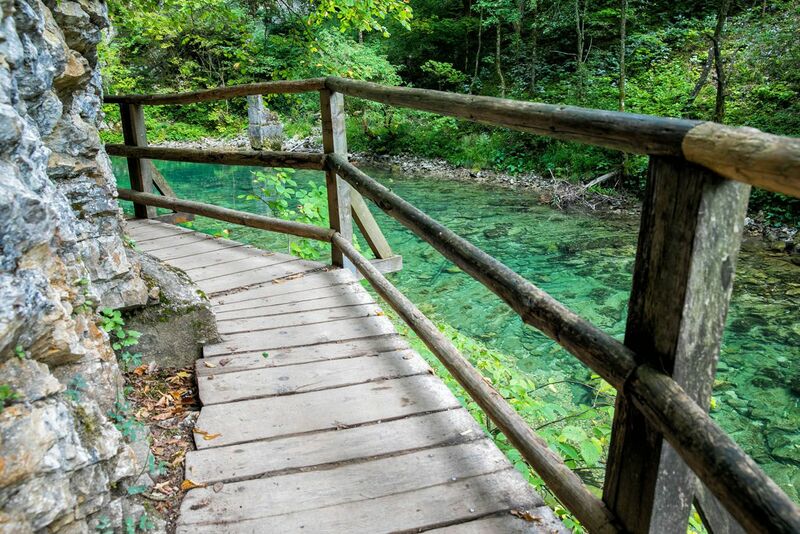 After you pay your entrance fee at the ticket booth, you are almost immediately greeted with boardwalk trails, small waterfalls, and scenic views of Vintgar Gorge. The first half of the gorge was our favorite part. 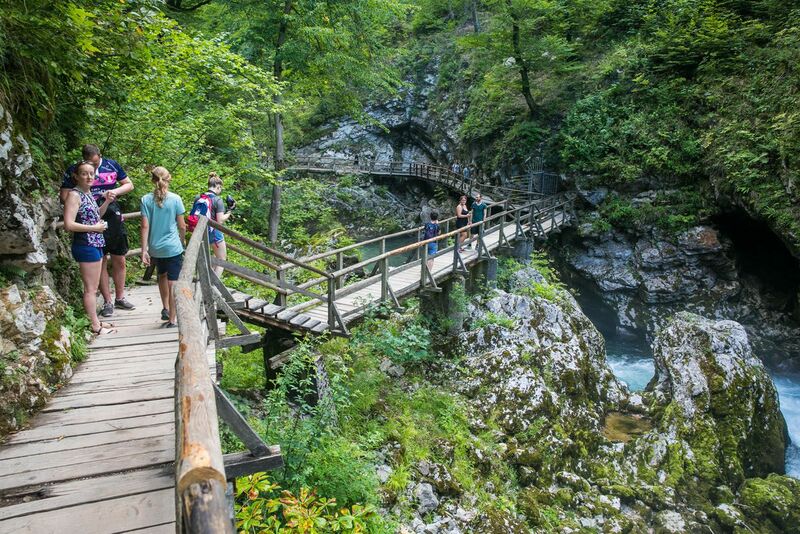 This is where you will walk on the most picturesque boardwalks, walk through canyons, and crisscross back and forth over the Radovna River on bridges. During the second half of the walk you still get to walk on boardwalks, but now you also get to walk along gravel paths along the river’s edge. At times, the river is wider here, and slower moving. And that’s part of the joy of this walk…watching as the river rushes through the narrow gorges and then opens up in the wider sections, only to narrow once more as it turns around another bend. 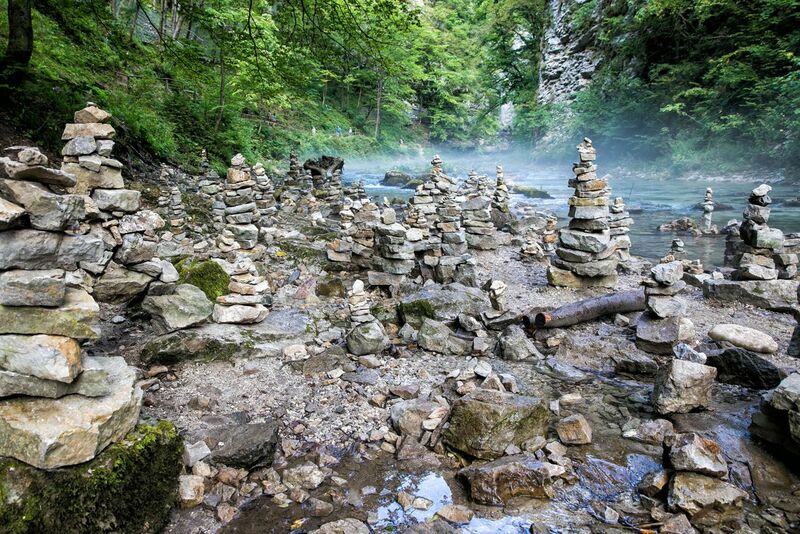 Along the river’s edge, prior visitors have built lots of cairns. During a misty morning, like the one we had, these can be very interesting to photograph. Towards the end of the gorge you will see this large stone bridge. Trains still run along this bridge, and one actually chugged by during our visit. The trail ends at another ticket booth and a small café. From here, you can take a detour to the Sum waterfall, just 60 meters away. At the end of the gorge you can turn around and retrace your steps back through the gorge or take a separate hiking trail through the valley. 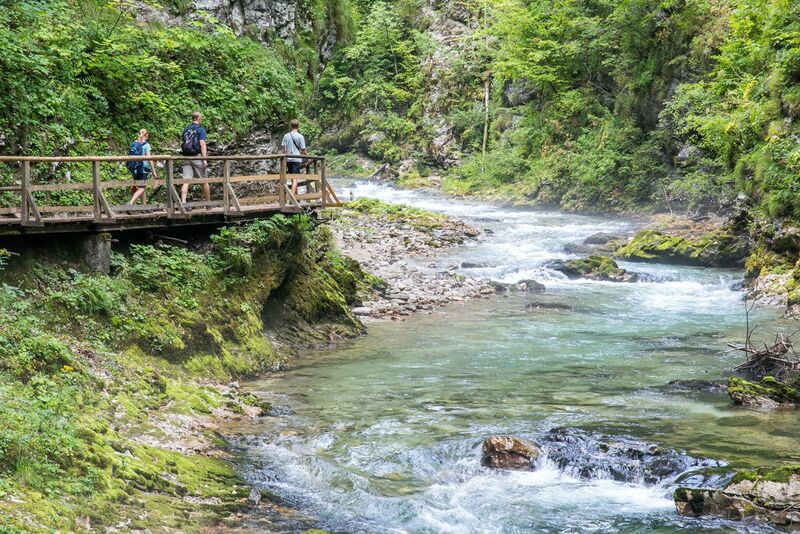 We had so much fun at Vintgar Gorge that we wanted to do it again, so we turned around and retraced our steps. 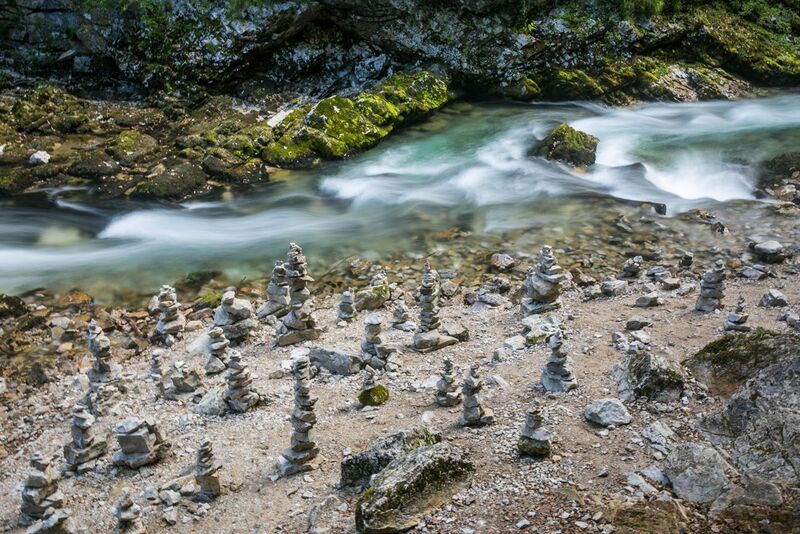 This gave me a second chance to take some photos I missed on our first pass through Vintgar Gorge. Here are some of our photos as we walked back towards the entrance. We visited Vintgar Gorge in August 2018. At opening time, there were just a few other people here. At 8 am, low-lying mist covered the river, creating a mysterious effect. By 9 am, most of the mist burned off. The first half of the walk, the walk to the far end of the gorge, was the best part of our visit. Around every turn was a new view. There weren’t too many people here yet, and even though we didn’t feel like we had the place to ourselves, it was easy to get the photos we wanted. It took us about one hour to walk the entire length of the gorge. At 9 am, we turned around and walked back. This was a much different experience. Now, many more people were on the trail, creating traffic jams as some parts of the trails are too narrow for two-way traffic. By the time we reached the exit, at 9:45 am, it was a steady flow of people into the gorge. I can’t emphasize this enough…if you want to have the best experience, get here right at opening time. One hour makes all the difference between a leisurely, pleasant walk on the boardwalks and crowded, slightly annoying experience. The next best time of day to visit the gorge is the last two hours before closing. Vintgar Gorge is a delight to photograph. It’s a gorgeous spot and the perfect place to photograph the river with long shutter speeds to freeze the action of the water. 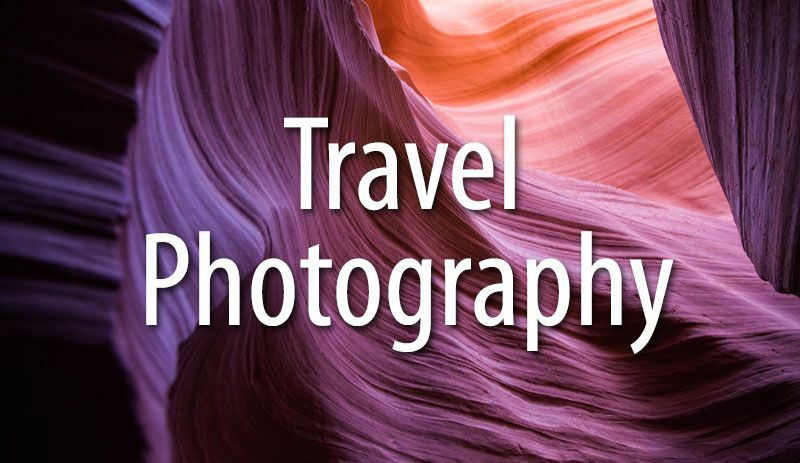 In order to do this, you will need a tripod. But you can’t use a traditional tripod. The boardwalks are narrow and a full-sized tripod will block the path of other visitors, creating traffic jams and lots of frustrated visitors. I don’t think that full-sized tripods are forbidden but they are not a good idea, especially during peak traffic times (which, in summer, is all day long). To get around this, I used a Gorilla Pod and attached it to the boardwalk railings. This way, I could stabilize the camera and not block traffic. But it’s not perfect. As people walk by, the boardwalks bounce and vibrate, which then shakes the camera, blurring your images. You have to time your photos with breaks in crowds. 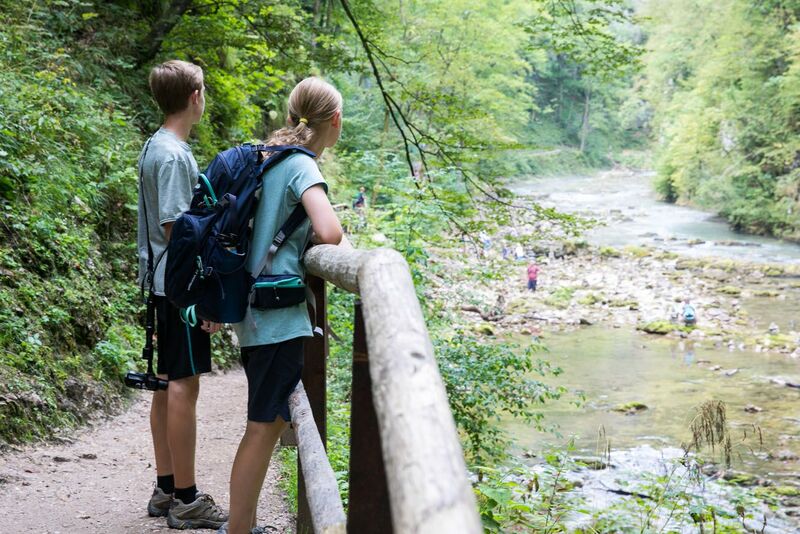 If you want, you can walk Vintgar Gorge one-way and then return to the parking lot on a separate hiking trail. There is a trail that starts at the far end of the gorge and leads to Sveta Katerina and back to the upper parking lot. The entire distance of the walk is 12.5 km round trip and can take between 3 and 4 hours. 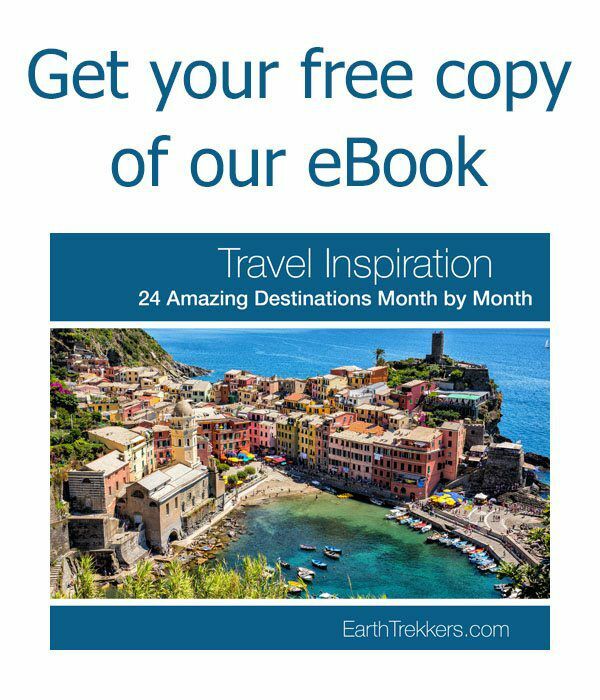 To learn more about this hike, or if you want a great resource for hiking in Triglav National Park and the Julian Alps, check out Walking the Julian Alps of Slovenia by Roy Clark and Justi Carey. We referenced this book a lot for Lake Bled, Lake Bohinj, and the Julian Alps. 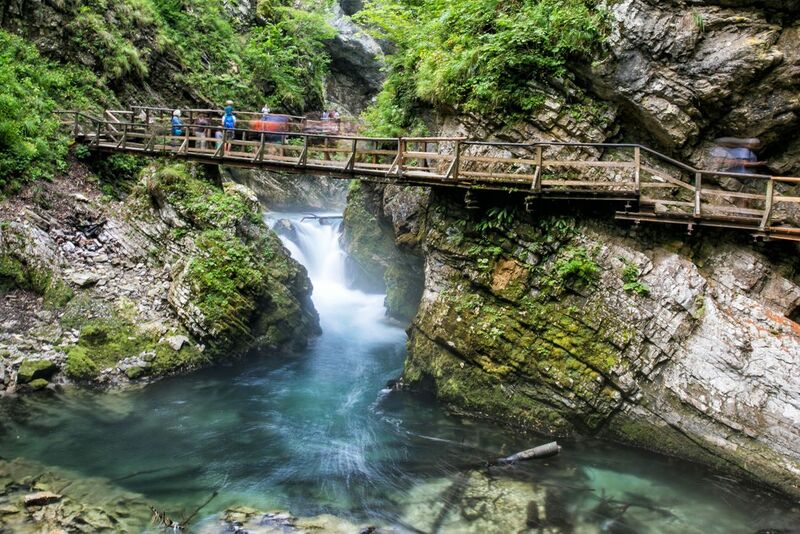 The spring and fall months are the best times to visit Vintgar Gorge. Crowds are manageable and the weather is pleasant. The worst months to visit the gorge are during peak season, the months of July and August. However, this is when we visited, and we still had a great experience, but the key was getting here at opening time. 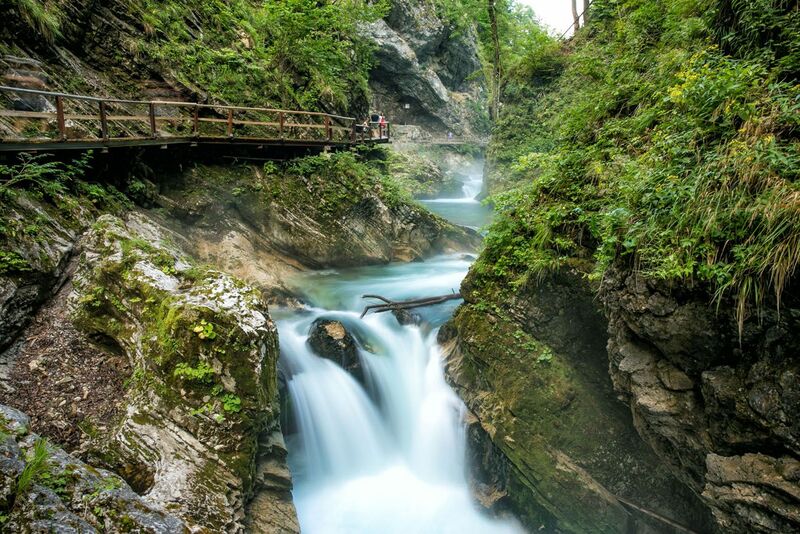 The best time of day to visit Vintgar Gorge is at opening time and one to two hours before closing time. The worst time of day to visit Vintgar Gorge is midday, between 10 am and 2 pm, when tourist buses dump loads of people off at the entrance to the gorge. This is a great place to take kids! They will love walking the boardwalks and the trails along the river. It’s essentially flat the entire way, with just a few short climbs, so it’s very easy to walk. The boardwalks have railings so it’s safe to walk without worrying about your kids taking a plunge into the Radovna River. Just leave your stroller in the car. These paths are narrow and strollers will take up the entire width of the boardwalk, creating traffic jams during the busy part of the day. We saw lots of families with kids of all ages, so this is a very popular family spot. 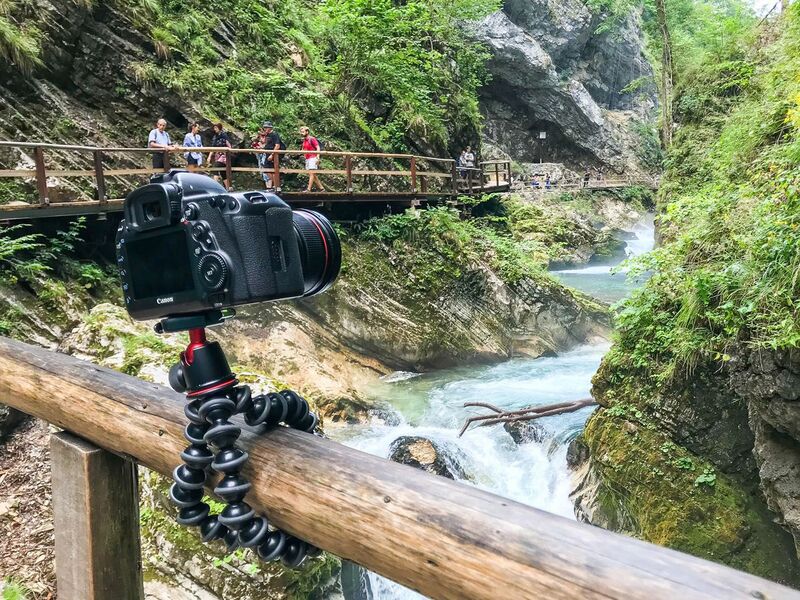 Vintgar Gorge or Tolmin Gorge? We visited both and the four of us unanimously agree that Vintgar Gorge was our favorite. 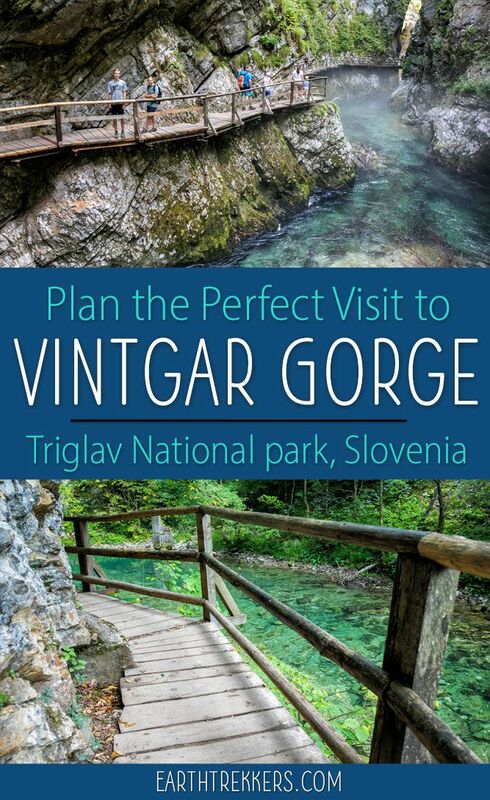 Vintgar is longer, more spectacular, more fun to visit, and easier to get to. I’d only recommend making the trip out to Tolmin Gorge if you also have plans to be in that area. 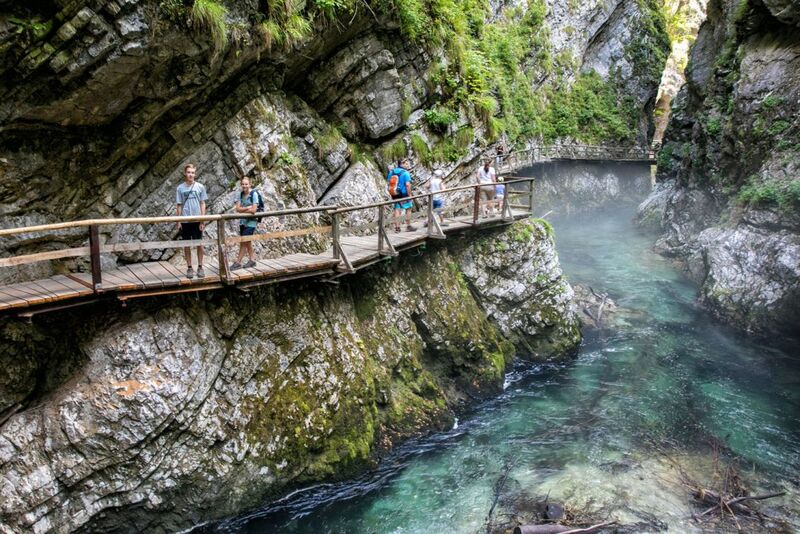 For example, if you are planning to visit Bovec and the Soca River valley. 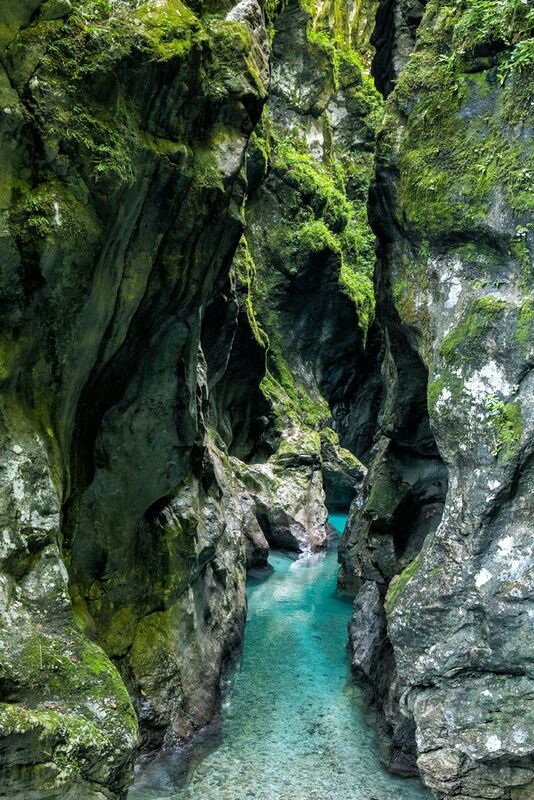 But just in case you are curious, here’s a view of the Tolmin Gorge. We stayed at the Apartment House Berghi in Kranjska Gora. We picked Kranjska Gora over Lake Bled because it was slightly cheaper, much easier to find accommodations, and located very close to the Vrsic Pass in Triglav National Park, one of Slovenia’s best hiking locations. 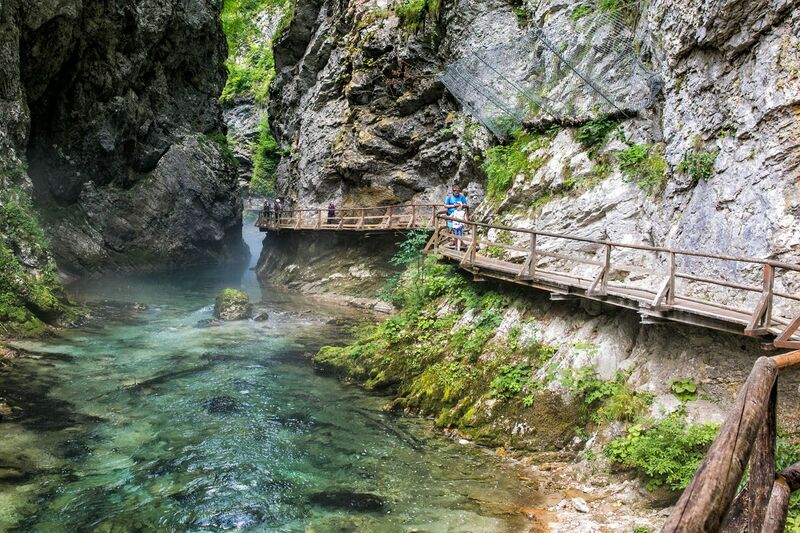 Kranjska Gora is a great place to make your home base for exploring Slovenia. This small town is filled with wonderful restaurants and is set with the backdrop of the jagged, rocky Julian Alps. 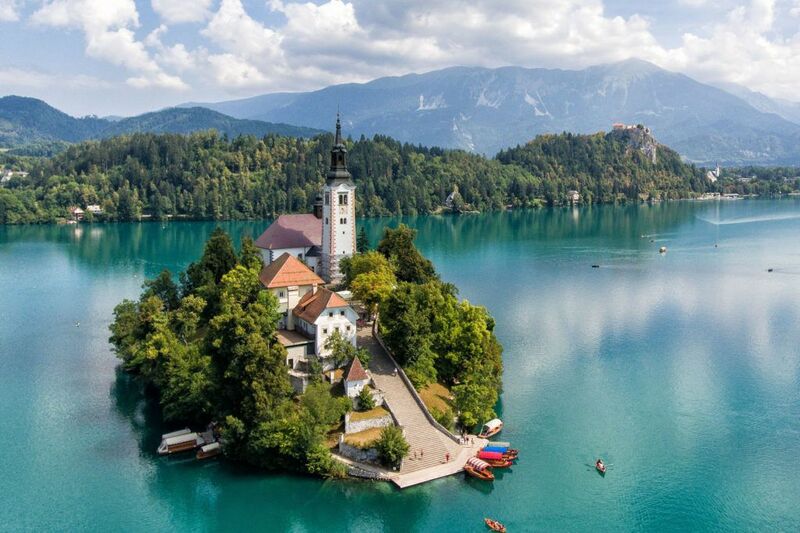 Plus, it’s much less crowded than Lake Bled so we did not have to deal with daily traffic jams getting to and from our accommodation. We loved Kranjska Gora, but I can’t say that we loved our apartment at the Apartment House Berghi. We had a huge amount of space, with three bedrooms, three bathrooms, and a full kitchen. But the apartment is not soundproofed well (every night we could clearly hear our neighbors talking and moving around) and this wasn’t the cleanest place we have stayed in. But it did offer lots of space, fast wifi, and a great location. If we did it again, we would probably stay at Hotel Skipass in Kranjska Gora. 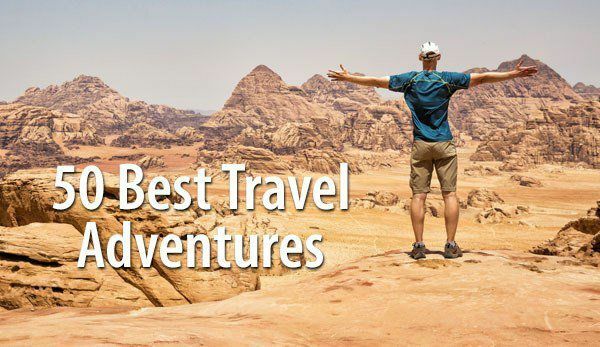 Are you going to Vintgar Gorge and Lake Bled? Comment below if you think we missed something or if you have any questions. We were in Ljubljana in August and also a day in Bled by bus (we were Interrailing, so no car ), and opted not to go. It was extremely busy in Bled and we didn’t want to walk in a crowd this gorge. But we absolutely fell in love with Slovenia (especially Piran) and will visit it sometime in June, when it is not too crowded. the whole summer was extremely hot. We live in the Netherlands and last summer was the hottest since 1976 (the year of birth of my husband) here. 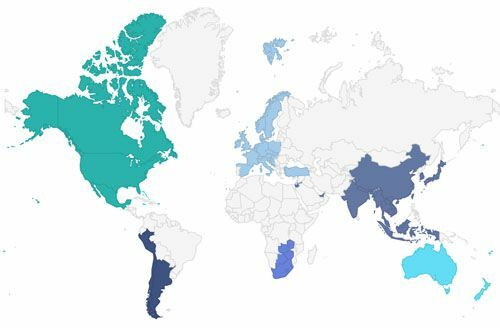 So we thought: It doesn’t matter where we go, it’s hot in Europe everywhere (and we were very thankful that we didn’t travel to Portugal and Spain with 50 C temperatures).